While the traditional chocolate wafer-and-creme sandwich has served Oreo well for years (after all, it is the country's best-selling cookie), the brand has never been one to shy away from trying new things. It's attempted unique variations inspired by everything from Swedish Fish and cinnamon buns, to Peeps and fireworks. In fact, its penchant for variety is so strong that it recently put out a call for fans to submit new flavor suggestions, and just unveiled three finalists it will soon put into production: Pina Colada, Kettle Corn, and Cherry Cola. Back in June, Oreo announced the #MyOreoCreation contest, inviting fans to propose new flavors to add to its lineup, and promising a cool $500,000 to the winning submission. 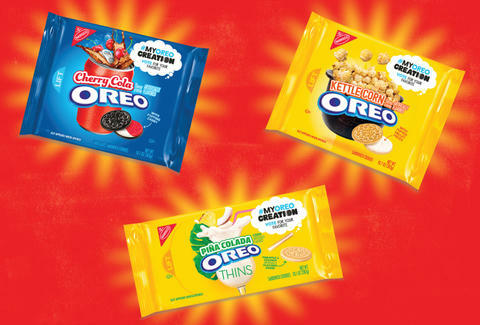 After testing, tasting, and reviewing hundreds of thousands of them, it's now narrowed the field to three finalists -- Pina Colada Oreo Thins, Kettle Corn Oreos, and Cherry Cola Oreos -- which will hit shelves in May so the public can weigh in and vote to help pick a winner. In addition to the MyOreoCreation update, the company also teased some new limited edition Oreo flavors that will be available in the coming months. On January 1, it will introduce two never-before-tasted flavors that sound like they'll pair well with the mid-winter cold weather: Chocolate Hazelnut and Spicy Hot Cinnamon. It will also be re-releasing the fan-favorite Marshmallow Peeps and Firework-flavored Oreos at some point in 2018. 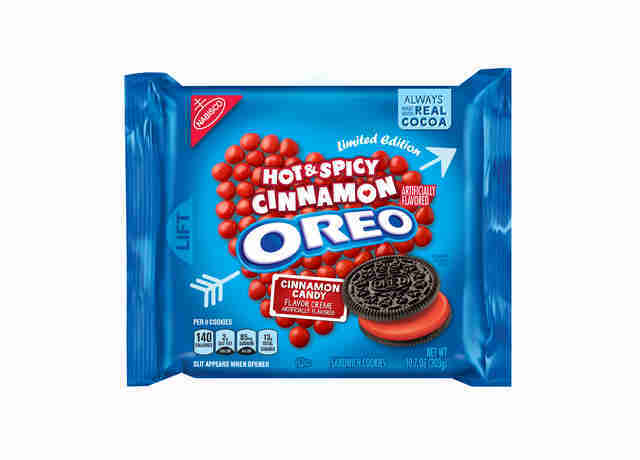 If your fiendish cravings can't hold out that long, there are a handful of other unique new Oreo offerings to spike your blood sugar with right now, including hot cocoa and candy bars.